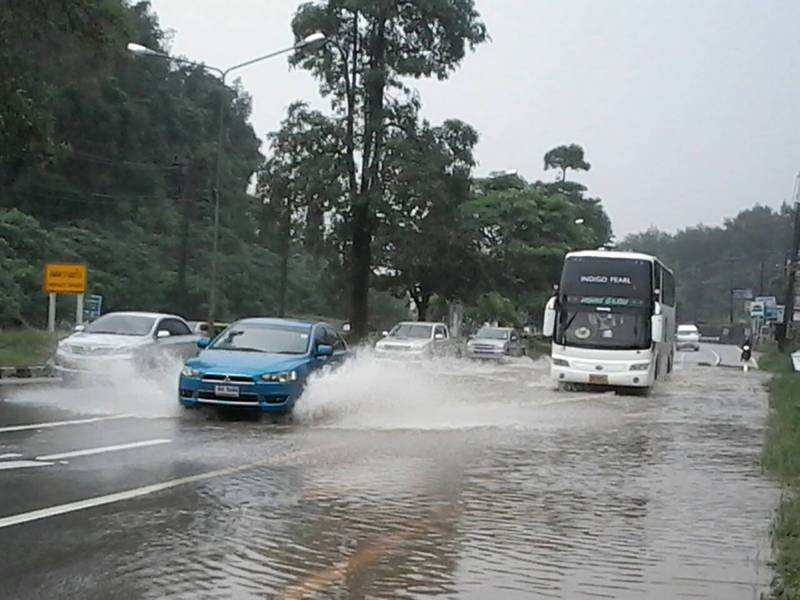 PHUKET: Flash floods in isolated areas have wrought havoc with traffic in Phuket as motorists attempted to navigate floodwaters that crossed major roads across the island. Traffic at the Sam Kong Intersection on the bypass road, where the island’s second underpass is still under construction, was drawn to a standstill last night (Sept 17). Many drivers were forced to take alternative routes to their destination as floodwaters crossed the roads there. However, the water soon dissipated and traffic flow resumed – albeit slowly – this morning (Sept 18). 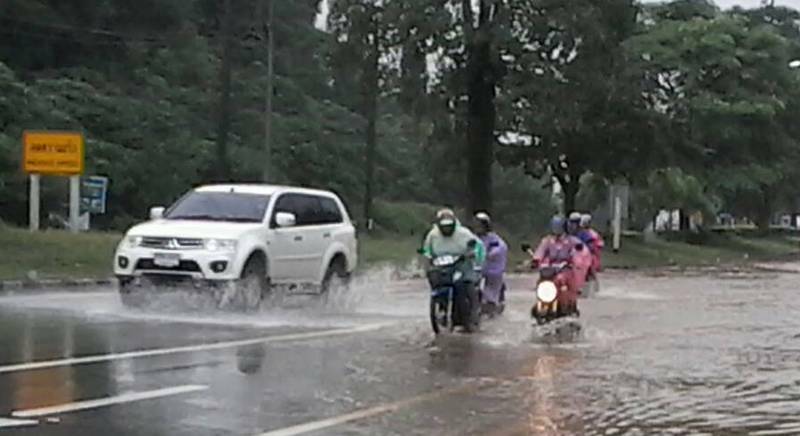 “There were no reports of floods in Kathu or other areas nearby,” one officer at Department of Disaster Prevention and Mitigation Phuket office (DDPM-Phuket) told The Phuket News this morning. “If there were other floods [in Kathu], the water probably drained away fairly quickly,” he said. 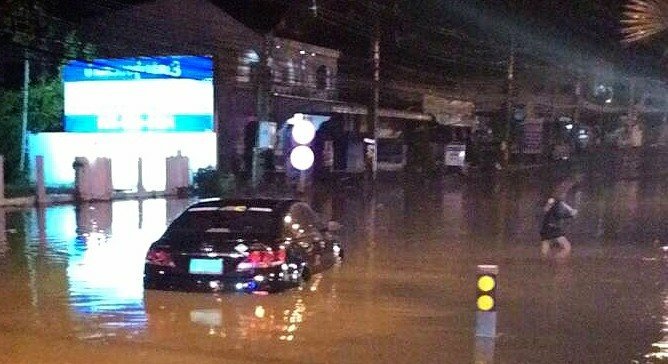 However, the northbound lanes of Thepkrasattri Rd were cut off in the Phuket’s central Srisoonthorn area, at 1:35am earlier today. 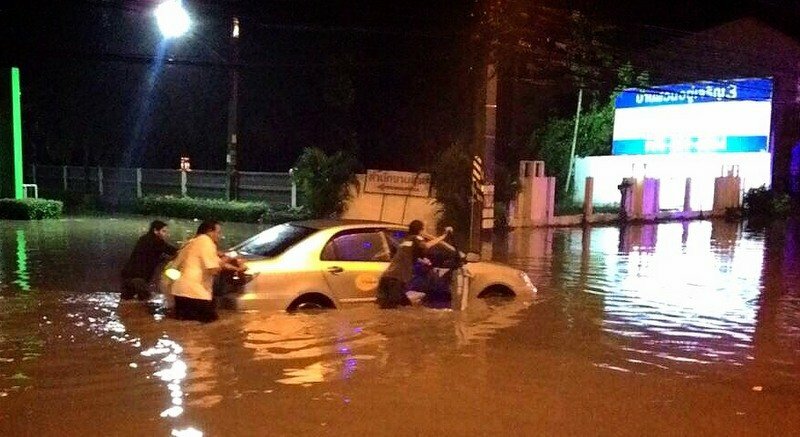 Cars were stranded in the floodwaters, while motorbikes could not pass at all. Only large vehicles managed to get through. Those flodwaters have drained to now allow all traffic to slowly pass through, the DDPM officer reported. The Department of Disaster Prevention and Mitigation Phuket office (DDPM-Phuket) today reissued its flood and landslide warning, extending the warning period through to Monday (Sept 21). The Thai Meteorological Department (TMD) also reissued its severe weather advisory today. “Widespread rain, as well as isolated heavy to very heavy rain, remains over the Central, the East and the South. People should beware of the severe weather conditions,” said the warning. Additional reporting by Eakkapop Thongtub.